Silence. That wonderful absence of sound that you’d think would be every mother’s best friend. When you have a curious and energetic toddler, however, that lack does nothing but raise suspicions–especially when said toddler is currently alone in his room–unless it can be verified that the child is safely passed out in his or her bed. Or, you know, on the floor in a pile of books and toys…whatever works. Muttering to myself, I waddle across the living room and haul my 8 month pregnant self up the stairs to see what my little darling is up to. What I find has me shaking my head in bewilderment. I will never understand the thought processes and logic of a two year old. Mine apparently thought it was a grand idea to empty his entire stash of fresh diapers from the diaper bin onto the floor and is currently ferreting them away in his play tent. 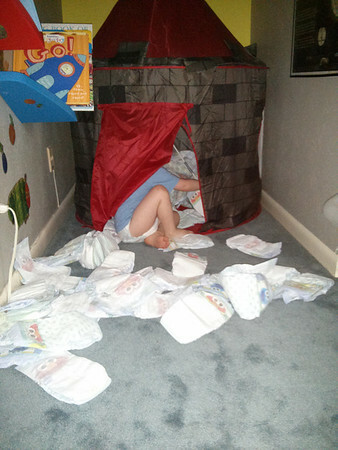 Yes…an entire economy size box of Pampers in his little toddler squirrel hole. Though, really, this is much better than the time I went to get him up from nap (which he never really took) to find that he had somehow commandeered an entire new package of wipes and removed every single one. I found them crammed into the crack between his mattress and his wall. The wipes now live on the top shelf of his closet. Before I became a parent, I was so proud of my achievements in academia and prided myself in the ability to have truly amazing intellectual conversations. Now, my conversations mostly center around poop and boogers, and my grandest plan for the future is making it through what I know will be a truly exhausting period coming soon where I have not only a mischievous, non-napping toddler to keep up with, but also a non-sleeping newborn. My husband has already suggested, should their energy levels be equivalent, that we tether them together and let them wear each other out. Sounds like a grand idea to me. And on that note, I must go retrieve the non-napping toddler unit who has exhausted the entertainment to be provided by building a stuffed animal fort in his bed and is currently screaming my name.